My six year old handles snakes like a pro. Granted, he was the third kid to hold this particular snake... but, even knowing it could bite him, he was more than willing to pick up a strange reptile. There's something good and decent about playing outside, getting dirty, catching lizards and walking around barefoot. But the other things? Live reasonably, stay out of the city if you can, get used to nature, plant a big garden and don't let fear be your master. I've watched a drone fly across the sky and felt a twinge of fear. I've heard a child scream and almost had my heart stop. I've put my foot down next to a rattlesnake and had my breath catch in my throat. But fear doesn't control me. There are things worth fearing... and things not worth fearing. Are you afraid of sinking financially? Ditch your debt, work harder, save, kill your cable, quit eating out, get rid of your house... and find freedom. Are you afraid of "not getting the girl?" There are more girls in the world. Keep approaching likely prospects (and, by all means, don't let her see any fear in your face); eventually, you'll have success. Are you afraid of spiders? HA HA HA! You're AFRAID OF SPIDERS??? LAME! Are you afraid of societal collapse? Good. It's probably coming. Plan ahead as best as you can and entrust the rest to God. And, by all means, pick up a snake every once in a while. If a six year old can do it... so can you. I have myrmecophobia -- the fear of ants. Not spiders, not snakes, not roaches... just ants. My little sister sat in a pile when I was four and she three and I can still see them swarming all over her. Shudder. You should see me breakdance when I one crawls on my foot. Yeah. I'm convinced ants will be in the New Heavens and the New Earth as they're beneficial to the plant world and we'll have plants there, so... It helps me to know that after they're "rebuilt" that if I drop my sandwich they'll be like, "Here's your sandwich, Mister de Vidal!" "Why thank you, mister ant! I don't know why I was so afraid of you before." "It's understandable!" Camping out has helped calm that fear a little. I don't wig out and constantly monitor the ground like I used to. Think I'll never get over the fear but as you said, getting exposure and suffering a few bites now and again isn't so bad. Can't wait til they're rebuilt though. Would I post something scary? I'm innocent! Innocent, I tell you! Oh OK, you're innocent and wouldn't post something scary. I'll just save the URL to look at later... (Later this evening) OK, let me watch at that video from David. Probably something about puppies or butterflies, knowing him.... (Watching) Breakdance time! Wasn't that cool as heck? I still play outside, get dirty, and walk around barefoot. . . but have accepted that my fear of them damn flying roaches (Florida Palmettos) will forever be a part of me. Seriously, just typing "Florida Palmetto" gives me the heebie-jeebies. One night when I was a teenager, my younger brother and I were watching an old movie after our parents went to bed. Out of the corner of my eye, I saw a movement... FLYING ROACH! Overall, we dispatched 14 in a strange and adrenaline filled quarter hour right from the Twilight Zone. It turns out they were all coming from beneath the corner cabinet in the kitchen. There was never another night like that. 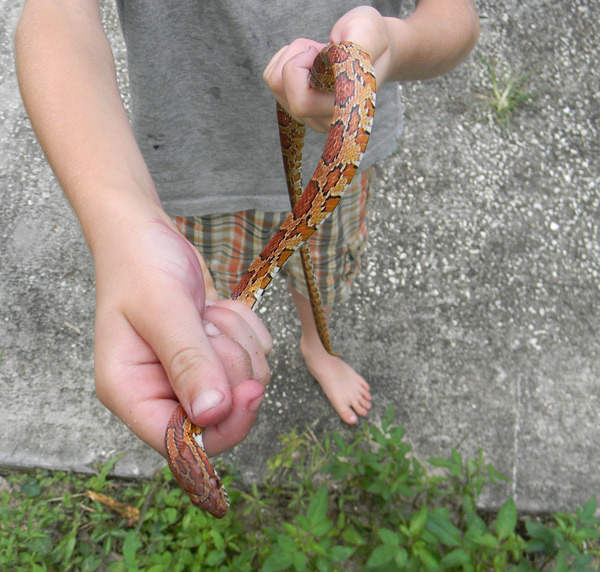 That is an adorable normal corn snake. we have one in a cage at home. Glad the kid is interested in such things, I have a nephew who is prissy with every little thing. boring!